2003-03-03 Assigned to ALLERGAN, INC. reassignment ALLERGAN, INC. ASSIGNMENT OF ASSIGNORS INTEREST (SEE DOCUMENT FOR DETAILS). Assignors: SCHIFFMAN, RHETT M.
A method for treating uterine disorders, including hyperplasic, hypertonic, cystic and/or neoplastic uterine gland tissue by local administration of a botulinum toxin to or to the vicinity of the afflicted uterine tissue. It is known that hyperplasic uterine tissues can, if not treated, develop into cancerous tissue. See e.g. Sivridis E. et al.,  Prognostic aspects on endometrial hyperplasia and neoplasia, Virchows Arch 2001 August;439(2):118-26. Additionally it is known that: different hyperplasia, metaplasic or atypical breast tissues can develop into cancers (see e.g. Ellis I. O., et al, Tumors of the Breast, chapter 16 (pages 865-930) of “Diagnostic Histopathology of Tumors”, volume 1, edited by Fletcher C. D. M., second edition, Churchill Livingstone (2000), discussed further infra, as well as Fabian C. J. et al Beyond tamoxifen new endpoints for breast cancer chemoprevention, new drugs for breast cancer prevention,. Ann NY Acad Sci 2001 December;952:44-59); hyperplasic intestinal tissues, such as polyps can transform into carcinomas (see e.g. Der, R. et al Gastric Neoplasms, chapter 5 (pages 105-144) of Chandraspma, P., “Gastrointestinal Pathology”, Appleton & Lange (1999), in particular pages 106-107; oral and oropharyngeal epithelial hyperplasia indicates a precancerous lesion. Sunaga H., et al. Expression of granulocyte colony-stimulating factor receptor and platelet-derived endothelial cell growth factor in oral and oropharyngeal precancerous lesions. Anticancer Res 2001 July-August;21 (4B):2901-6, and; kidney and prostate cell hyperplasia has been documented as a factor leading to development of cancerous cells. Van Poppel, H., et al., Precancerous lesions in the kidney Scand J Urol Nephrol Suppl 2000;(205): 136-65. Botulinum toxin type A is the most lethal natural biological agent known to man. About 50 picograms of botulinum toxin (purified neurotoxin complex) type A 1 is a LD50 in mice. One unit (U) of botulinum toxin is defined as the LD50 upon intraperitoneal injection into female Swiss Webster mice weighing 18-20 grams each. Seven immunologically distinct botulinum neurotoxins have been characterized, these being respectively botulinum neurotoxin serotypes A, B, C1, D, E, F and G each of which is distinguished by neutralization with type-specific antibodies. The different serotypes of botulinum toxin vary in the animal species that they affect and in the severity and duration of the paralysis they evoke. For example, it has been determined that botulinum toxin type A is 500 times more potent, as measured by the rate of paralysis produced in the rat, than is botulinum toxin type B. Additionally, botulinum toxin type B has been determined to be non-toxic in primates at a dose of 480 U/kg which is about 12 times the primate LD50 for botulinum toxin type A. Botulinum toxin apparently binds with high affinity to cholinergic motor neurons, is translocated into the neuron and blocks the release of acetylcholine. Although all the botulinum toxins serotypes apparently inhibit release of the neurotransmitter acetylcholine at the neuromuscular junction, they do so by affecting different neurosecretory proteins and/or cleaving these proteins at different sites. For example, botulinum types A and E both cleave the 25 kiloDalton (kD) synaptosomal associated protein (SNAP-25), but they target different amino acid sequences within this protein. Botulinum toxin types B, D, F and G act on vesicle-associated protein (VAMP, also called synaptobrevin), with each serotype cleaving the protein at a different site. Finally, botulinum toxin type C 1 has been shown to cleave both syntaxin and SNAP-25. These differences in mechanism of action may affect the relative potency and/or duration of action of the various botulinum toxin serotypes. The molecular weight of the botulinum toxin protein molecule, for all seven of the known botulinum toxin serotypes, is about 150 kD. Interestingly, the botulinum toxins are released by Clostridial bacterium as complexes comprising the 150 kD botulinum toxin protein molecule along with associated non-toxin proteins. Thus, the botulinum toxin type A complex can be produced by Clostridial bacterium as 900 kD, 500 kD and 300 kD forms. Botulinum toxin types B and C 1 is apparently produced as only a 500 kD complex. Botulinum toxin type D is produced as both 300 kD and 500 kD complexes. Finally, botulinum toxin types E and F are produced as only approximately 300 kD complexes. The complexes (i.e. molecular weight greater than about 150 kD) are believed to contain a non-toxin hemaglutinin protein and a non-toxin and non-toxic nonhemaglutinin protein. These two non-toxin proteins (which along with the botulinum toxin molecule comprise the relevant neurotoxin complex) may act to provide stability against denaturation to the botulinum toxin molecule and protection against digestive acids when toxin is ingested. Additionally, it is possible that the larger (greater than about 150 kD molecular weight) botulinum toxin complexes may result in a slower rate of diffusion of the botulinum toxin away from a site of intramuscular injection of a botulinum toxin complex. Botulinum toxin type A can be obtained by establishing and growing cultures of Clostridium botulinum in a fermenter and then harvesting and purifying the fermented mixture in accordance with known procedures. All the botulinum toxin serotypes are initially synthesized as inactive single chain proteins which must be cleaved or nicked by proteases to become neuroactive. The bacterial strains that make botulinum toxin serotypes A and G possess endogenous proteases and serotypes A and G can therefore be recovered from bacterial cultures in predominantly their active form. In contrast, botulinum toxin serotypes C 1, D and E are synthesized by nonproteolytic strains and are therefore typically unactivated when recovered from culture. Serotypes B and F are produced by both proteolytic and nonproteolytic strains and therefore can be recovered in either the active or inactive form. However, even the proteolytic strains that produce, for example, the botulinum toxin type B serotype only cleave a portion of the toxin produced. The exact proportion of nicked to unnicked molecules depends on the length of incubation and the temperature of the culture. Therefore, a certain percentage of any preparation of, for example, the botulinum toxin type B toxin is likely to be inactive, possibly accounting for the known significantly lower potency of botulinum toxin type B as compared to botulinum toxin type A. The presence of inactive botulinum toxin molecules in a clinical preparation will contribute to the overall protein load of the preparation, which has been linked to increased antigenicity, without contributing to its clinical efficacy. Additionally, it is known that botulinum toxin type B has, upon intramuscular injection, a shorter duration of activity and is also less potent than botulinum toxin type A at the same dose level. The success of botulinum toxin type A to treat a variety of clinical conditions has led to interest in other botulinum toxin serotypes. A study of two commercially available botulinum type A preparations (BOTOX® and Dysport®) and preparations of botulinum toxins type B and F (both obtained from Wako Chemicals, Japan) has been carried out to determine local muscle weakening efficacy, safety and antigenic potential. Botulinum toxin preparations were injected into the head of the right gastrocnemius muscle (0.5 to 200.0 units/kg) and muscle weakness was assessed using the mouse digit abduction scoring assay (DAS). ED 50 values were calculated from dose response curves. Additional mice were given intramuscular injections to determine LD50 doses. The therapeutic index was calculated as LD50/ED50. Separate groups of mice received hind limb injections of BOTOX® (5.0 to 10.0 units/kg) or botulinum toxin type B (50.0 to 400.0 units/kg), and were tested for muscle weakness and increased water consumption, the later being a putative model for dry mouth. Antigenic potential was assessed by monthly intramuscular injections in rabbits (1.5 or 6.5 ng/kg for botulinum toxin type B or 0.15 ng/kg for BOTOX®). Peak muscle weakness and duration were dose related for all serotypes. Water consumption was greater in mice injected with botulinum toxin type B than with BOTOX®, although botulinum toxin type B was less effective at weakening muscles. After four months of injections 2 of 4 (where treated with 1.5 ng/kg) and 4 of 4 (where treated with 6.5 ng/kg) rabbits developed antibodies against botulinum toxin type B. In a separate study, 0 of 9 BOTOX® treated rabbits demonstrated antibodies against botulinum toxin type A. DAS results indicate relative peak potencies of botulinum toxin type A being equal to botulinum toxin type F, and botulinum toxin type F being greater than botulinum toxin type B. With regard to duration of effect, botulinum toxin type A was greater than botulinum toxin type B, and botulinum toxin type B duration of effect was greater than botulinum toxin type F. As shown by the therapeutic index values, the two commercial preparations of botulinum toxin type A (BOTOX® and Dysport®) are different. The increased water consumption behavior observed following hind limb injection of botulinum toxin type B indicates that clinically significant amounts of this serotype entered the murine systemic circulation. The results also indicate that in order to achieve efficacy comparable to botulinum toxin type A, it is necessary to increase doses of the other serotypes examined. Increased dosage can comprise safety. Furthermore, in rabbits, type B was more antigenic than as BOTOX®, possibly because of the higher protein load injected to achieve an effective dose of botulinum toxin type B. It is known to use a botulinum toxin to treat: intrathecal pain (see e.g. U.S. Pat. No. 6,113,915); paragangliomas (see e.g. U.S. Pat. No. 6,139,845); otic disorders (see e.g. U.S. Pat. No. 6,265,379); pancreatic disorders (see e.g. U.S. Pat. Nos. 6,143,306 and 6,261,572); migraine (see e.g. U.S. Pat. No. 5,714,468); smooth muscle disorders (see e.g. U.S. Pat. No. 5,437,291); prostate disorders, including prostatic hyperplasia (see e.g. WO 99/03483 and Doggweiler R., et al  Botulinum toxin type A causes diffuse and highly selective atrophy of rat prostate, Neurourol Urodyn 1998;17(4):363); autonomic nerve disorders, including hyperplasic sweat glands (see e.g. U.S. Pat. No. 5,766,606); wound healing (see e.g. WO 00/24419); reduced hair loss (see e.g. WO 00/62746); skin lesions (see e.g. U.S. Pat. No. 5,670,484), and; neurogenic inflammatory disorders (see e.g. U.S. Pat. No. 6,063,768). U.S. Pat. No. 6,063,768 cursorily discloses at column 6 lines 39-42 treatment of the inflammatory joint condition pigmented villonodular synovitis and a particular type of joint cancer, synovial cell sarcoma. Column 6, line 53 of U.S. Pat. No. 6,063,768 also discloses, without further explanation, that “tumors” can be treated. A botulinum toxin has been injected into the pectoral muscle to control pectoral spasm. See e.g. Senior M.,  Botox and the management of pectoral spasm after subpectoral implant insertion, Plastic and Recon Surg, July 2000, 224-225. The botulinum toxins are intracellular proteases that act specifically on one or more of three different proteins which control the docking of acetylcholine to containing secretory vesicles. These specific substrates for the botulinum toxins are synaptobrevin, syntaxin and/or SNAP-25. See e.g. Duggan M. J., et al.,  A survey of botulinum neurotoxin substrate expression in cells, Mov Disorder 10(3);376:1995, and Blasi J., et al., Botulinum neurotoxin A selectively cleaves the synaptic protein SNAP-25. Nature 365; 160-163:1993. For botulinum toxin types B, D, F and G the particular intracellular substrate is synaptobrevin. SNAP-25, synaptobrevin and syntaxin are known as SNAREs (soluble N-ethylmaleimide sensitive factor attachment protein receptors). Significantly, it is not only the nerves which innervate muscles which contain the substrate for the botulinum toxins: “The presence of SNAP-25 in presynaptic regions of numerous neuronal subsets and in neural crest cell lines suggests that this protein subserves an important function in neuronal tissues.” Oyler G. A. et al.,  Distribution and expression of SNAP-25 immunoreactivity in rat brain, rat PC-12 cells and human SMS-KCNR neuroblastoma cells, Brain Res Dev Brain Res 1992 February 21;65(2):133-146, 1992. Additionally, “[T]he wide occurrence of the SNARE proteins in endocrine cells suggests that they may also serve as general diagnostic markers for endocrine tumors . . . ”, Graff, L., et al. Expression of vesicular monoamine transporters, synaptosomal-associated protein 25 and syntaxin1: a signature of human small cell lung carcinoma, Cancer Research 61, 2138-2144, Mar. 1, 2001, at page 2138. For example, it is known that SNAP-25 is widely distributed in neuroendocrine cells (including in chromaffin cells, PC12, GH3, and insulinomas). Furthermore, the botulinum toxin substrate synaptobrevin has been found in fibroblasts and myeloid cells (e.g. mast cells). Duggan M., et al., supra. Indeed, SNAREs apparently influence or control the membrane fusion of secretory vesicles in most if not all secretory cells. Andersson J., et al,  Differential sorting of SNAP-25a and SNAP-25b proteins in neuroblastoma cells, Eur J. Cell Bio 79, 781-789:November 2000. (11) normal lung cells (Zimmerman U. J., et al.,  Proteolysis of synaptobrevin, syntaxin, and SNAP-25 in alveolar epithelial type II cells, IUBMB Life 1999 October; 48(4): 453-8), and; (12) all ovarian cells (Grosse J., et al., Synaptosome associated protein of 25 kilodaltons in oocytes and steroid producing cells of rat and human ovary: molecular analysis and regulation by gonadotropins, Biol Reprod 2000 August; 63(2): 643-50 (SNAP-25 found “in all oocytes and in steroidogenic cells, including granulosa cells (GC) of large antral follicles and luteal cells”. Diverse hyperplasic and neoplastic mammary gland cells are influenced by cholinergic mechanisms. Thus, it has been discovered that there is a “cholinergic mechanism in the alveolar cells activity”. Balakina G.B., et al.,  Localization of choline acetyltransferase in the alveolar portion of the mammary gland of the white mouse, Arkh Anat Gistol Embriol 1986 April;90(4):73-7. Additionally, there is cholinergic influence upon both mammary dysplasia (fibrocysts) and mammary carcinoma tissues (Dorosevich A.E., et al., Autonomic nerve endings and their cell microenvironment as one of the integral parts of the stromal component in breast dysplasia and cancer, Arkh Patol 1994 November-December;56(6):49-53), as well as “a direct cholinergic stimulation of smooth muscle cells” in mammary arteries (Pesic S., et al., Acetylcholine-induced contractions in the porcine internal mammary artery; possible role of muscarinic receptors, Zentralbl Veterinarmed A 1999 October; 46(8): 509-15). Significantly, an increase in acetylcholine due to inhibition of cholinesterase has been implicated in increase mammary cell proliferation followed by the development of mammary carcinomas. Cabello G., et al,  A rat mammary tumor model induced by the organophosphorous pesticides parathion and malathion, possibly through acetylcholinesterase inhibition, Environ Health Perspect 2001 May; 109(5):471-9. Thus, a decrease in breast cancer cell proliferation appears to be mediated by a cholinergic mechanism. Panagiotou S., “Opioid agonists modify breast cancer cell proliferation by blocking cells to the G2/M phase of the cycle: involvement of cytoskeletal elements, J Cell Biochem 1999 May 1;73(2):204-11. An embodiment of the present invention is a method for treating a uterine disorder by local administration of between about 10 −3 U/kg and about 2000 U/kg of a Clostridial neurotoxin to a uterine glandular tissue. The Clostridial neurotoxin can be a botulinum toxin. Preferably, the botulinum toxin is administered in an amount of between about 10−2 U/kg and about 200 U/kg. More preferably, the botulinum toxin is administered in an amount of between about 10−1 U/kg and about 35 U/kg. The botulinum toxin is selected from the group consisting of botulinum toxins types A, B, C, D, E, F and G and the preferred botulinum toxin is botulinum toxin type A. A more detailed embodiment of the present invention is a method for treating a uterine gland disorder by local administration of between about 10 −3 U/kg and about 2000 U/kg of a botulinum toxin type A to a uterine gland of a human patient, thereby a uterine gland disorder. Additionally, the present invention encompasses a method for preventing development of a uterine gland neoplasm, the method comprising the step of local administration of a botulinum toxin to a hyperplasic or hypertonic uterine gland tissue, thereby reducing a secretion from the hyperplasic or hypertonic uterine gland tissue and preventing the hyperplasic or hypertonic uterine gland tissue from developing into a neoplasm. In this method the botulinum toxin is administered in an amount of between about 10 −3 U/kg and about 2,000 U/kg and the botulinum toxin is selected from the group consisting of botulinum toxin types A, B, C, D, E, F and G. The botulinum toxin can be locally administered by direct injection of the botulinum toxin into the hyperplasic or hypertonic uterine gland tissue. Alternately, a method for preventing development of a uterine neoplasm can comprise the step of local administration of between about 10 −3 U/kg and about 2000 U/kg of a botulinum toxin to a hyperplasic tissue, wherein the botulinum toxin reduces a secretion from the hyperplasic tissue by inhibiting a vesicle mediated exocytosis from the precancerous hyperplasic uterine tissue, thereby preventing development of the hyperplasic tissue into a neoplasm. The hyperplasic tissue can comprise a substrate for the botulinum toxin selected from the group of vesicle membrane docking proteins consisting of a 25 kiloDalton synaptosomal associated protein (SNAP-25), synaptobrevin and syntaxin. Furthermore, the botulinum toxin can be administered in an amount of between about 1 U and about 40,000 U, such as between about 10−3 U/kg and about 35 U/kg, between about 10−2 U/kg and about 25 U/kg, between about 10−2 U/kg and about 15 U/kg or between about 1 U/kg and about 10 U/kg. and the local administration of the botulinum toxin is carried out by implantation of a botulinum toxin implant into or onto the body of the uterine tissue. A detailed embodiment of the present invention is a method for preventing development of a uterine gland carcinoma (that is by preventing the development of a benign [though hyperplasic, metaplasic or atypical] precancerous uterine tissue into a malignant neoplasm or carcinoma), the method comprising the step of local administration of between about 10 −3 U/kg and about 2000 U/kg of a botulinum toxin type A to a hyperplastic, metaplasic or atypical uterine tissue (such as an apocrine cell lined cyst) of a human patient, wherein the uterine tissue comprises a substrate for the botulinum toxin selected from the group of vesicle membrane docking proteins consisting of a 25 kiloDalton synaptosomal associated protein (SNAP-25), synaptobrevin and syntaxin, and wherein the botulinum toxin acts upon the substrate to reduce a secretion from the afflicted uterine tissue. The present invention includes within its scope a method for treating a neoplasm by local administration of between about 10 −3 U/kg and about 2000 U/kg of a botulinum toxin to the neoplasm, thereby treating the neoplasm by either reducing the size of the neoplasm and/or by reducing a secretion from the uterine neoplasm. A method according to the present invention can be carried out by direct injection of a botulinum toxin into the body of a neoplasm or by implantation of a botulinum toxin implant into or onto the body of the uterine neoplasm. A method within the scope of the present invention can be practiced to locally administer between about 10 −3 U/kg and about 2000 U/kg of a botulinum toxin to a neoplasm. U/kg means units of a botulinum toxin per kilogram of total patient weight. The botulinum toxin can be one of the botulinum toxin types A, B, C1, D, E, F and G, and is preferably a botulinum toxin type A because of the known clinical efficacy of botulinum toxin type A for a number of indications and because of its ready availability. In a more preferred embodiment of the present invention, the amount of a botulinum toxin type A locally administered to the body of or to a site within the body of the uterine neoplasm according to the present invention can be an amount between about 10 −3 U/kg and about 40 U/kg. Less than about 10−3 U/kg of a botulinum toxin type A is not expected to result in a significant therapeutic efficacy, while more than about 40 U/kg of a botulinum toxin type A can be expected to result in a toxic or near toxic dose of the toxin. With regard to a botulinum toxin type B, the amount of a botulinum toxin type B locally administered to the neoplasm according to the present invention can be an amount between about 10−3 U/kg and about 2000 U/kg. Less than about 10−3 U/kg of a botulinum toxin type B is not expected to result in a significant therapeutic efficacy, while more than about 2000 U/kg of a botulinum toxin type B can be expected to result in a toxic or near toxic dose of the type B toxin. It has been reported that about 2000 units/kg, intramuscular, of a commercially available botulinum toxin type B preparation approaches a primate lethal dose of type B botulinum toxin. Meyer K. E. et al, A Comparative Systemic Toxicity Study of Neurobloc in Adult and Juvenile Cynomolgus Monkeys, Mov. Disord 15(Suppl 2);54;2000. With regard to the botulinum toxins types C, D, E, F and G, amounts for injection into a neoplasm can be determined on a patient by patient basis and are not expected to exceed the type B toxin dose range. In a more preferred embodiment of the present invention, the amount of a type A botulinum toxin administered according to the disclosed methods is between about 10 −2 U/kg and about 25 U/kg. Preferably, the amount of a type B botulinum toxin administered by a continuous release system during a given period is between about 10−2 U/kg and about 1000 U/kg, since it has been reported that less than about 1000 U/kg of type B botulinum toxin can be intramuscularly administered to a primate without systemic effect. Ibid. More preferably, the type A botulinum toxin is administered in an amount of between about 10−1 U/kg and about 15 U/kg. Most preferably, the type A botulinum toxin is administered in an amount of between about 1 U/kg and about 10 U/kg. In many instances, an intra-neoplastic administration of from about 1 units to less than about 100 units of a botulinum toxin type A, can provide effective and long lasting therapeutic relief, as set forth herein. More preferably, from about 5 units to about 75 units of a botulinum toxin, such as a botulinum toxin type A, can be used and most preferably, from about 5 units to about 50 units of a botulinum toxin type A, can be locally administered into a target neoplasm tissue with efficacious results. In a particularly preferred embodiment of the present invention from about 1 unit to about 50 units of a botulinum toxin, such as botulinum toxin type A, can be locally administered to a neoplasm target tissue with therapeutically effective results, as described herein. A detailed method within the scope of the present invention can be carried out by local administration of between about 10 −3 U/kg and about 2000 U/kg of a botulinum toxin type A to a neoplasm of a human patient, thereby reducing a secretion from the uterine neoplasm. The botulinum toxin can be a modified botulinum toxin, that is the botulinum toxin can have at least one of its amino acids deleted, modified or replaced, as compared to a native botulinum toxin. Thus, the botulinum toxin can be a recombinant produced botulinum toxin or a derivative or fragment thereof. FIG. 3 is diagramatic cross sectional representation of the uterus of FIG. 2 showing location of different types of uterine fibroids. Without wishing to be bound by theory, a physiological mechanism for the efficacy of the present invention can be proposed. Thus, it is known that uterine muscle tissue is influenced by cholinergic neurons. See e.g. Morris, J., et al,  Botulinum neurotoxin A attenuates release of norepinephrine but not NPY from vasoconstrictor neurons, Am J Physiol Heart Circ Physiol 2002 December;283(6). Additionally, it is known that cholinergic innervation of uterine glandular tissues affects the secretory activity of such cells. See e.g. Hammarstron M., et al., Does nitric oxide act as a cellular messenger in muscarinic endometrial secretion in the guinea-pig?, Acta Physiol Scand 2002 April;174(4):311-5. Thus, uterine secretory cells receive at least a sympathetic cholinergic secremotor innervation. Hence it can be postulated that local administration of a botulinum toxin to a uterine glandular tissue can act to reduce secretory activity by such glandular cells (either by inhibition of secretion promoting, cholinergic innervation to the cells or by a direct effect upon of the toxin upon uterine glandular cells wherein toxin substrates SNAP-25 or VAMP promote membrane docking or fusion of secretory vesicles), thereby reducing a uterine glandular hyperplasia, which leads to a remission of fibroid development and furthermore inhibits progression or development of a hyperplasic (i.e. precancerous) uterine glandular cell into a uterine cancer, tumor or neoplasm. The route of administration and amount of botulinum toxin administered can vary widely according to the particular uterine gland disorder being treated and various patient variables including size, weight, age, disease severity and responsiveness to therapy. Method for determining the appropriate route of administration and dosage are generally determined on a case by case basis by the attending physician. Such determinations are routine to one of ordinary skill in the art (see for example,  Harrison's Principles of Internal Medicine (1997), edited by Anthony Fauci et al., 14th edition, published by McGraw Hill). Treatment is carried out so as to substantially avoiding entry of the toxin into the systemic circulation (i.e. by use of subcutaneous or intramuscular injection as opposed to intravenous administration). The present invention includes within its scope the use of any neurotoxin which has a long duration therapeutic effect when locally applied to a precancerous uterine tissue of a patient. For example, neurotoxins made by any of the species of the toxin producing Clostridium bacteria, such as  Clostridium botulinum, Clostridium butyricum, and Clostridium beratti can be used or adapted for use in the methods of the present invention. Additionally, all of the botulinum serotypes A, B, C, D, E, F and G can be advantageously used in the practice of the present invention, although type A is the most preferred serotype, as explained above. Practice of the present invention can provide target tissue atrophy and remission for 27 months or longer in humans. It is known that catecholamine release from permeabilized adrenal medulla cells can be inhibited by a botulinum toxin. Additionally, it is known that release of insulin from permeabilized (as by electroporation) insulin secreting cells can be inhibited by a botulinum toxin. When in vitro, the cell membranes of these non-nerve cells can be permeabilized to assist introduction of a botulinum toxin into the cell's cytosol due to the lack of cell surface receptors for a botulinum toxin. Thus, botulinum toxin type B apparently inhibits insulin secretion by cleaving synaptobrevin present in the insulin secreting cell line HIT-15. Boyd R. S., et al  The Effect of Botulinum Neurotoxin-B On Insulin Release From a Beta Cell, Mov Disord 10(3):376 (1995). It is the inventor's contention that a botulinum toxin can block the release of any vesicle mediated exocytosis from any secretory (i.e. 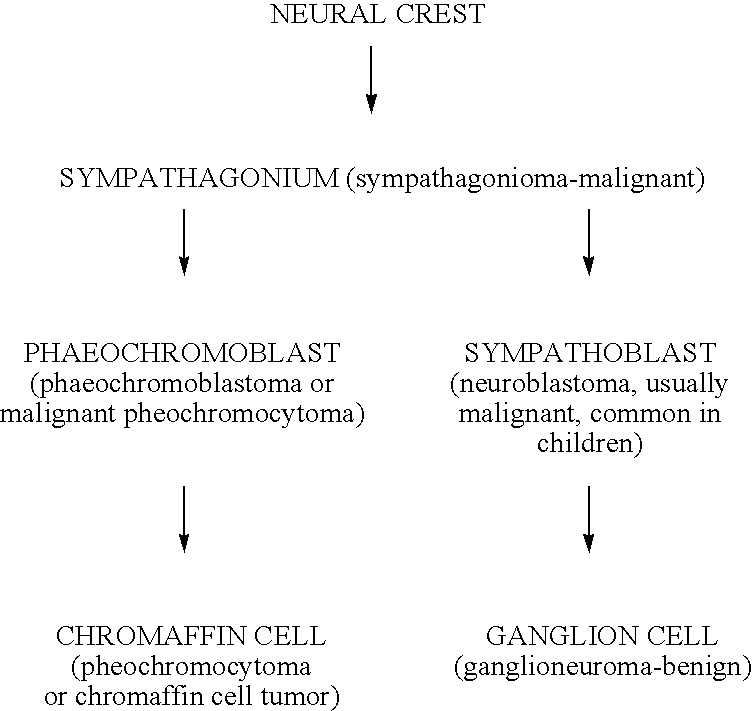 neuronal, glandular, secretory, chromaffin) cell type, as long as the light chain of the botulinum toxin is translocated into the intracellular medium. For example, the intracellular protein SNAP-25 is widely distributed in both neuronal and non-neuronal secretory cells and botulinum toxin type A is an endopeptidase for which the specific substrate is SNAP-25. Thus, while cholinergic neurons have a high affinity acceptor for the botulinum and tetanus toxins (and are therefore more sensitive than other neurons and other cells to the inhibition of vesicle mediated exocytosis of secretory compounds), as the toxin concentration is raised, non-cholinergic sympathetic neurons, chromaffin cells and other cell types can take up a botulinum toxin and show reduced exocytosis. 1. A method for treating a uterine glandular disorder, the method comprising the step of local administration of between about 10−3 U/kg and about 2000 U/kg of a Clostridial neurotoxin to a uterine gland, thereby treating a uterine gland disorder. 2. The method of claim 1, wherein the Clostridial neurotoxin is a botulinum toxin. 3. The method of claim 2, wherein the botulinum toxin is administered in an amount of between about 10−2 U/kg and about 200 U/kg. 4. The method of claim 2, wherein the botulinum toxin is administered in an amount of between about 10−1 U/kg and about 35 U/kg. 5. The method of claim 2, wherein the botulinum toxin is selected from the group consisting of botulinum toxins types A, B, C, D, E, F and G.
6. The method of claim 2, wherein the botulinum toxin is botulinum toxin type A. 7. The method of claim 2, wherein local administration of the botulinum toxin is carried out by implantation of a botulinum toxin implant into or onto a uterine gland. 8. The method of claim 1, wherein the uterine gland disorder is selected from the group consisting of precancerous uterine tissue and uterus cancer. 9. A method for treating a uterine gland disorder, the method comprising the step of local administration of between about 10−3 U/kg and about 2000 U/kg of a botulinum toxin type A to a uterus of a human patient, thereby treating a uterine gland disorder by reducing a secretion from the uterine gland. and treating a uterine gland disorder. 10. A method for treating a uterine fibroid, the method comprising the step of local administration of between about 10−3 U/kg and about 2000 U/kg of a botulinum toxin to a uterine fibroid, thereby treating a uterine fibroid. 11. A method for treating a uterine gland disorder, the method comprising the step of local administration of a botulinum toxin to a uterine gland or to the vicinity of a precancerous uterus tissue, thereby causing a reduction in the size and/or activity of a hyperplastic, hypertonic or neoplastic uterine gland tissue. 12. A method for treating a uterine gland disorder, the method comprising the step of local administration of a therapeutic amount of a botulinum toxin to a hyperplastic, hypertonic or neoplastic uterine gland tissue, thereby causing a reduction in the diameter of the hyperplastic, hypertonic or neoplastic uterine gland tissue of between about 20% and about 100%. 13. A method for preventing development of a uterine gland neoplasm, the method comprising the step of local administration of a botulinum toxin to a hyperplasic or hypertonic uterine gland tissue, thereby reducing a secretion from the hyperplasic or hypertonic uterine gland tissue and preventing the hyperplasic or hypertonic uterine gland tissue from developing into a neoplasm. 14. A method for preventing development of a uterine neoplasm, the method comprising the step of local administration of a therapeutic amount of a botulinum toxin type A to the precancerous hyperplasic or hypertonic uterine gland tissue of a human patient, thereby preventing development of a uterine gland neoplasm. 15. The method of claim 14 wherein the hyperplasic uterine tissue comprises a substrate for the botulinum toxin selected from the group of vesicle membrane docking proteins consisting of a 25 kiloDalton synaptosomal associated protein (SNAP-25), synaptobrevin and syntaxin. 16. A method for preventing development of a uterine carcinoma, the method comprising the step of local administration of between about 10−3 U/kg and about 2000 U/kg of a botulinum toxin type A to a hyperplastic uterus tissue of a human patient, wherein the hyperplastic uterus tissue comprises a substrate for the botulinum toxin selected from the group of vesicle membrane docking proteins consisting of a 25 kiloDalton synaptosomal associated protein (SNAP-25), synaptobrevin and syntaxin, and wherein the botulinum toxin acts upon the substrate to reduce a secretion from the hyperplasic uterus tissue. MXPA01004254A (en) 1998-10-27 2002-04-24 Mayo Foundation Methods for enhancing wound healing. Felberbaum et al. 1998 Treatment of uterine fibroids with a slow-release formulation of the gonadotrophin releasing hormone antagonist Cetrorelix. ES2335310T3 (en) 2010-03-24 Botulinum toxin therapy for skin diseases.